Now as much as I am a huge fan of being frugal, I also appreciate that you must risk waste in order to discover greatness, so my inner scientist gets her chance to play quite a bit. I have on countless times metaphorically shaken my fist at the sky when a recipe hasn't worked out, and 9 times out of 10, the recipe is from the Internet. This is not to say that all internet recipes do not work, they all work on some level, but they don't always meet my expectations. 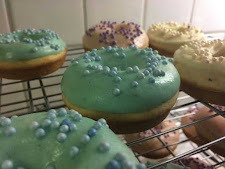 Yesterday I had some friends come around for a donut party; I had some piecrust ideas of two evenings of baking beforehand so that my guests could decorate them using the left over glazes that were accumulating in my refrigerator, requiring precious Tupperware tubs. That of course didn't happen, considering that my day job has been especially busy over the past few weeks, and my motivation to do anything when I get home is very low. I decided to compensate by making a 'base' cake so that there was something for my guests to eat whilst donuts were being made, and made an uncharacteristically non-cautious move to try a new recipe as my only option. Risk taker, that I am. In the last few months, I have really been increasing my usage of Pinterest, I didn't really get the concept at first, and to be honest, I probably still don't, however it has proved to be a great source of recipes and ideas for me. Check out my Social Media buttons at the top right of this window to see my perception of the site. Constructive opinions always welcome of course! 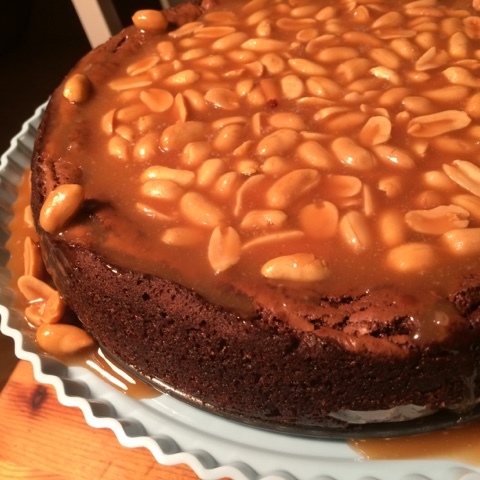 Anyhoo, the picture of this recipe was far too much for me to resist, however as it has peanuts, it's a recipe I would avoid making as taking it to work where there are many people who have nut allergies would not be such a good idea. The recipe worked well... I did add a 1/2 teaspoon of bicarbonate of soda rather than 1/4, and the cake rose well in the oven, nearly to the top of my springform tin. This was far more than I thought it would seeing as it is a brownie cake, but not an unpleasant surprise. No, no, that occurred after I took it out of the oven. It was all very sad. The cake sank in the middle, quite possibly a combination of the excess bicarb, or over beating when adding the dry ingredients. I must admit that I am reluctant to blame myself as it is not my style to over beat... I have a knack for 'lagom' mixing, and as much as it is feasible as a principle, the amount of bicarbonate does not usually affect the rise unless it is in excess of a 1.5 teaspoons, so unfortunately, innocent or not, I am holding the ratios of the recipe responsible here. It doesn't help the recipes's case that the caramel timings were a bit off, but I can be more forgiving of that as I believe the person who made the recipe lives in a warmer climate than I do, so that is understandable. 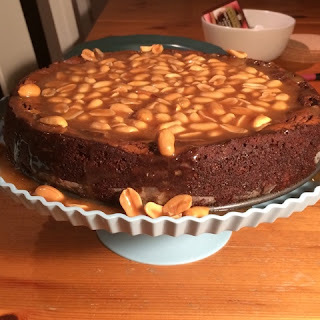 I haven't had an opportunity to taste the cake just yet, but I did taste the peanut caramel butterscotch, and was suitably impressed. Such a great combination. I just love caramel, in its many different forms: caramel, caramel sauce, butterscotch (yes, I have been researching, as the word 'caramel' is bandied about covering many different things with a similar taste and/or consistency, yet varying ingredients). Adding peanuts to pretty much any of these forms is a natural combination, and was a joy to be able to do it myself for once with no guilt or worries about striking someone down with an anaphylactic reaction. I am not completely writing this recipe off as a base, but I do have plenty of other sure-fire brownie recipes I could use. I will however always remember that peanut caramel butterscotch sauce, and have some ideas of how to tweak it... I guess I need to have some more guests over so I can test it out! Putting cake where your mouth is! Chocolate Surprise Microwave Brownie Cake + Recipe! Recipe bases credited where possible. Please contact Samara's Baked Goods for amendments. Ethereal theme. Powered by Blogger.